This is the perfect time of year to find properly ripe Medlars. This unusual fruit is distantly related to the rosehip. The taste of the flesh is somewhat akin to an apple with a nutty vanilla taste. They can be made into a pectin rich jelly. I had a go at this last year on a blog post here. In the Spring, the Medlar tree has wonderful, large flowers. 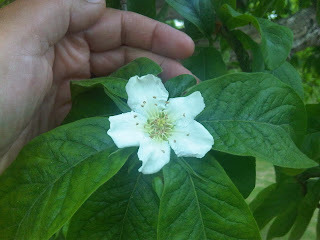 For many years in many countries the appearance of the blossom end of the Medlar has been likened to a Dogs Bottom!... in fact the language used in France is 'Un bout de chien' literally translated as 'Dogs Arse'!! 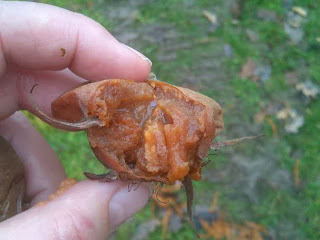 I will leave this to your imagination.. have a look at my finished product here as I labelled the Medlar jelly last year. 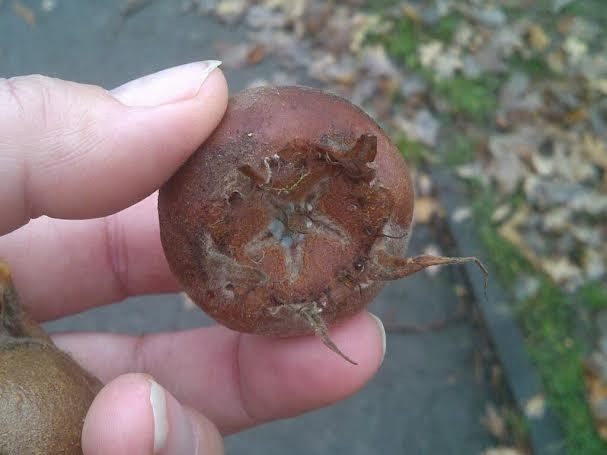 The key feature of eating a ripe Medlar is that it is left on the tree to ripen to such a degree that it goes soft and brown. 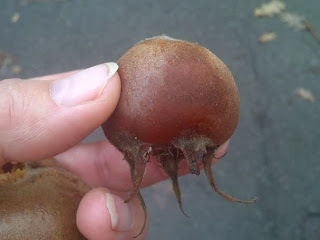 This process is called 'bletting' a properly bletted Medlar is soft and sweet. This takes a while of cold, even frosty weather to ripen to a delicious, soft flesh. So from one dog's bottom to another... Leo says hello! A little piece of heaven right here in West London is the Seeds of Italy HQ, I went there this weekend for a peek at their new 2014 catalogue and to enjoy a festive celebration with free Panetone and Coffee! Paolo is the seventh generation of seedsmen here, someone with whom I am not afraid to have a totally nerdy conversation about varieties of vegetables! His knowledge of the regional vegetable varieties in Italy is just amazing! Many varieties suit the British climate well, Italy has its share of cooler, wetter climates too. So my early Christmas treat was to browse the shelves for unusual vegetables! I was in veggie heaven! So much to choose... so what did I go for? Stevia - officially I must call this a decorative shrubby plant, for it is not legal to sell it as a natural sweetner... 250 times sweeter than sugar!... might mix with some rhubarb next year.. Climbing yellow flat beans - won't these look wonderful with my purple Blauhilde next year? Aniseed - I look forward to making some interesting drinks next Summer..aniseed gin anyone? Vegetable Spaghetti - Never grown this before, always wanted to....can't wait. These lovely Winter squash are really good keepers. I think this one is a cross between Queensland Blue and Crown Prince. If they are 'cured' properly after picking.. ie. letting the skin set or harden in the warm sun or on a warm windowsill, they will keep indefinitely. Those lovely square shoulders are very typical of the Queensland Blue but the colour is more silver like the Crown Prince. Lots of sweet, firm flesh. I usually steam, roast or microwave the flesh to cook it. Boiling just adds too much moisture and you want it as dry as possible. Sieve the cooked pumpkin and drain for at least 24 hours to allow water to drain out. You will then need to mix 1 cup pumpkin (8oz) 3 eggs, 4oz dark sugar, 1 desert spoon flour, 1/2 cup cream (4oz), and spices of your choice. I use ginger, cinnamon, nutmeg.. I like it spicy so add about a teaspoon of each if you like it. The mixture will be sloppy, do not be alarmed, it is like an egg custard at this stage. Pour into a pastry case and cook at #8 gas - 220C for 10 minutes at first, then turn the oven down to #4 gas 180c for about 30 minutes until it stops wobbling. My secret ingredient is the desert spoonful of flour, I find it helps set the mixture.